Originally from Shanghai, my two-year residence at St. John’s College UBC, between November 2000 and December 2002, has been one of the most cherished and memorable experiences of my life. Having experienced the life at SJC, as well as associated with the Johannean Alumni Association in Vancouver, I feel St. John’s College has been the epitome of carrying forward the true light and tradition of the former Shanghai-based St. John’s University. St. John’s College has cultivated a nurturing and intellectually stimulating community for graduate students, visiting scholars, and postdoctoral fellows from all corners of the world. Its unique culture to embrace and celebrate diversity, which permeates each fibre of the resident life, allows the young Johanneans to make friends, to show their talents, and to share their expertise of their passionately chosen disciplines. Resident life is full of both academic and enjoyable activities. Well can I remember the Coffeehouse concerts with such as brilliant displays of singing, dancing, acting, and poetry reading; the many cultural celebrations such as Oktoberfest, Festival of Lights, Halloween costume and pumpkin carving contest, Easter Egg Hunting, and the technology wizards who dedicated their time to the creation of an online magazine Life@SJC, the recording of the Johannean song and the making of a short movie of residents’ experiences. In addition, there were many stimulating talks, discussions, lectures and conferences held within the college on an exceptionally broad range of topics. These included talks on international relations by diplomats, political analyses by prominent politicians, such as the Consul General of Canada to Seattle, the Chinese Consul general in Vancouver, and John Atta Mills, the former President of Ghana, with whom I had a memorable picture taken at the SJC International Dinner. Moreover, there were faculty talks, an international TeleHealth Conference exploring the potential of technology on health care, and numerous residents’ talks ranging from bioregionalism examining humans’ allegiance to a place, on classic Chinese poetry, the scientific knowledge of our daily tea and coffee, and a very educational and entertaining talk on wines. We were also honoured to have very notable talks by Johanneans from St. John’s University. Mr T. F. Ying, a prominent Johannean from the Shanghai era of the 30’s and 40’s, delivered a solemn history lesson on his Alma Mater in peacetime and in turmoil. It was a history little known to the junior fellows at SJC. Dr. George Shen, a Johannean and a passionate aficionado of Peking Opera, gave us a talk. It was an education on the treasure of Chinese culture, combining a brief history and the operatic basics such as facial make-ups and their assigned roles. The lecture culminated with Dr. Shen donning a theatrical beard to stage a most forceful recitation. His expertise and his passion were certainly infectious. Finally, one more notable lecture during my residence must be mentioned. It was on the subject of iodine deficiency by Jack Ling, a clinical professor of public health. The lecture enriched our knowledge of the humble table salt: its health benefits, its distribution in the world, prevalence in seafood and the particulars of Canadian law regarding it. It was hard for me to bid farewell to the College. However, my memories of St. John’s College will always be with me like camphor seeds from the trees on the campus of former St. John’s University, which symbolize the Alma Mater. The seeds, sprouting time and again in my mind, will ignite for me, a smile here, a conversation there in the recreated pleasance of bygone days. 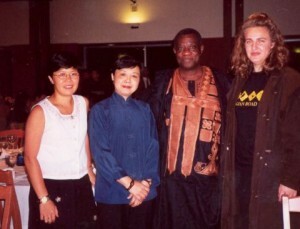 Cheryl (2nd from left) with John Atta Mills (3rd from left and friends in 2002.